Prosciutto and peas are meant to go together, there is even a famous pasta sauce that adds cream to these two ingredients. 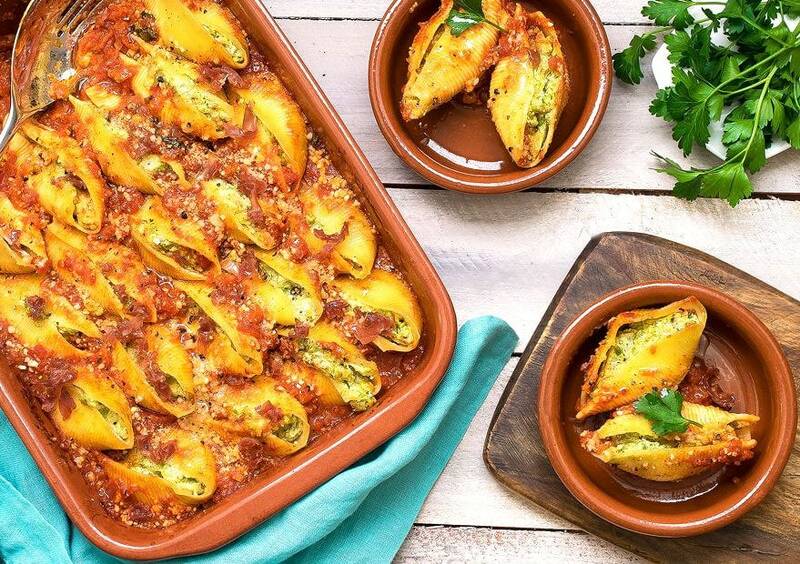 I was in an inventive mood, and instead of making the basic ricotta and spinach stuffed pasta shells, which you can easily find in the frozen section at your local grocery store, I wanted to kick the flavors up a notch, and so combined these two Italian ideas together. This is such a flavorful dish with the sweetness of the peas, creaminess of the ricotta and the salty bite of the prosciutto, it is a match made in heaven. 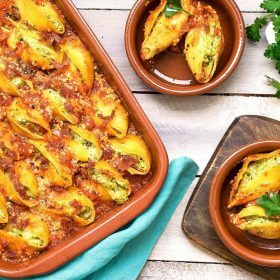 With just a few ingredients, you can make this dish as a starter for a large party, or as a complete dinner that you and your family will thoroughly enjoy. This recipe is an absolute bomb! It combines a few key ingredients to create one of the most delicious pasta casseroles I ever tried. In a large pot of salted boiling water, add the pasta shells and cook until they just start to become soft, about 6 or 7 minutes. 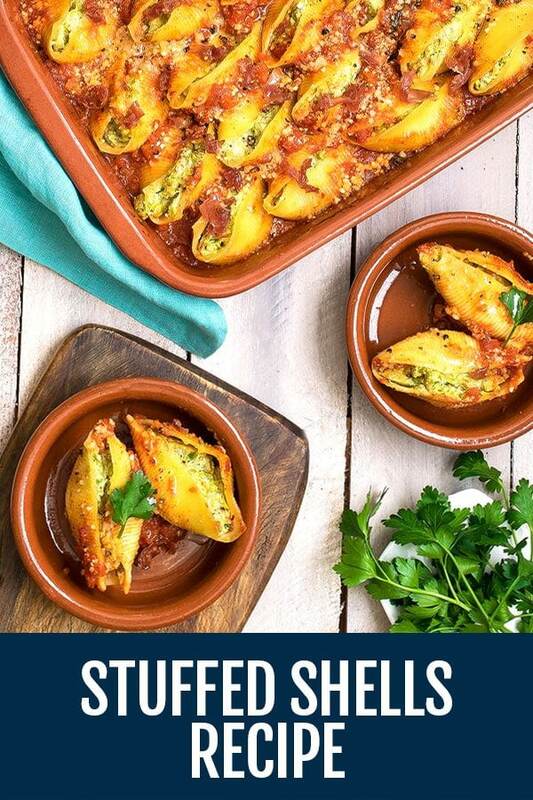 Drain and drizzle with olive oil to avoid the shells sticking. Cover with plastic wrap and set aside. Heat the olive oil in a large sauté pan over medium heat. Add the shallots and sauté until translucent about 3 minutes. Add the peas, salt and pepper and stir to combine, cook for 8 minutes stirring continuously. Add 1/4 cup of water and cook until completely absorbed. Transfer the peas to a food processor, add the ricotta, prosciutto and Parmigiano. Blend until you get a creamy mixture. Transfer to the refrigerator and let it rest for 10 minutes. Heat the olive oil in a large sauté pan over medium heat. Add the garlic and cook for about 3 minutes. Add the tomatoes, basil and salt and bring to a simmer, stirring often. Lower the heat, cover and simmer for 30 minutes until thick. Remove from heat and let it rest. Spread two ladles of the tomato sauce to bottom of a large baking pan. Stuff all the shells with the filling and place them filling side up. Scoop the rest of the tomato sauce in between the shells sprinkle with Parmigiano. Bake at 375º for 30 to 35 minutes.